US Oncology Research, one of the leading community-based cancer research networks in America based in The Woodlands, Texas, and Baylor College of Medicine, have launched a clinical trial titled “Scalp Cooling Alopecia Prevention Trial” (SCALP), which will examine an existing scalp cooling system aiming to critically reduce or completely stop chemotherapy-related hair loss, which occurs in about 65% of cancer patients undergoing chemotherapy and is one of the most disturbing and stressful factors in cancer patient care. Statistical evidence states that 47% of women patients consider it the most traumatic side of chemotherapy, and 8% would refuse treatment for fear of the side-effect. Hair loss can have a tremendous impact on how an individual perceives their body image, sexuality, and self-esteem, since it is frequently associated with cancer treatment. 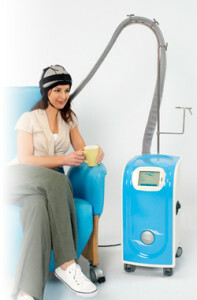 The Orbis Paxman Hair Loss Prevention System uses a soft lightweight silicone cap placed on the patient’s head about 30 minutes before and 90 minutes after the chemotherapy session, and is connected to a refrigeration structure enabling the circulation of a special coolant, thereby lowering the scalp temperature. Refrigerating the scalp during and after chemotherapy treatments results in blood vessel constriction, thus minimizing the damage to the cells lining the hair root. This cooling system has been used in multiple European countries, Australia, and Canada, with data indicating that between 50 and 75% of patients do not suffer from alopecia when the system is used. With such promising results, the goal of the current clinical trial is to test the safety and complete effectiveness of the system in women with breast cancer undergoing neoadjuvant or adjuvant chemotherapy. So far, a total of 15 patients have registered and approximately 50 more are being recruited at three US Oncology Research sites: Texas Oncology-Baylor Charles A. Sammons Cancer Center, Dallas, Texas, led by Cynthia Osborne, M.D. ; Texas Oncology-Memorial City, Houston, Texas, led by Frankie Ann Holmes, M.D., and Hematology-Oncology Associates of Northern New Jersey, P.A., Morristown, N.J., led by Steven Papish, M.D., F.A.C.P. Newly diagnosed female patients (18 years or older) with stage 1-2 breast cancer planning to undergo at least 4 cycles of full-dose anthracycline or taxane neoadjuvant or adjuvant chemotherapy are encouraged to contact one of these three participating centers for more information.